One of the greatest contributors to the development of the style of playing of the Shahjahanpur Gharana, Mohammed Ameer Khan was born in 1877, in Shahjahanpur. When he was about nine or ten years old, his father Ustad Abdullah Khan moved from Shahjahanpur to accept the position of a court musician in Dwarbhanga, now in the state of Bihar in India. During this time, Abdullah Khan also made several trips to Bengal for performances. The Zamindars or feudal landlords that the British government had appointed as the local governors were great connoisseurs of music and art. The Zamindars organized music soirees at their courts and it was customary for them to invite famous musicians and dancers from all over the country to come and perform as a way to show off their wealth. Ameer Khan started learning Sarod when he was just four or five years old from his father, Ustad Abdullah Khan. Extensive training and rigorous practice turned him into one of the finest musicians of his time in the country. Around 1916, Ameer Khan came to the court of the Zamindar of Talanda in Rajshahi (now in Bangladesh) to perform and teach music. 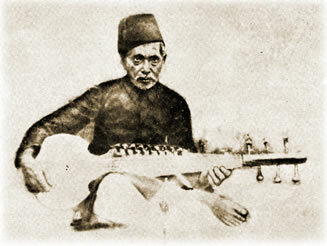 He started teaching music to Brojendra Mohan Maitra, father of Radhika Mohan Maitra. When Radhika Mohan was four, he started teaching him as well. As a composer, he was prolific like his father Abdullah Khan and uncle Murad Ali Khan. Between the three of them, they composed over 500 Gats. The compositions were mainly in the style of Ghulam Reza, known popularly as Rezakhani Gats, and those of Feroze Khan, called Ferozekhani Gats. Ameer Khan produced a very rich line of musicians proficient in Sarod, Sur-Shringar, Indian Banjo, Sitar, and the ancestral Dhrupad Rabab. Amongst his disciples were some well-known musicians such as Timir Baran Bhattacharya, Nirendra Krishan Mitra, Ashutosh Kundu, Nani Gopal Motilal, Hafiz Ali Khan, and Radhika Mohan Maitra. Extremely shy and an introvert by nature, the Ustad was inclined to record only one disc (78 RPM, Raga Kafi and Pahadi) at the earnest request from the famous poet and composer Kazi Nazrul Islam, then Program Director of the record company HMV. He recorded using a Sarod belonging to his disciple Radhika Mohan, which happened to be lying in a corner in the office of Kazi Nazrul inside the studio. Towards the end of the year 1934, when Radhika Mohan was just 17 years old, Ameer Khan passed away in Rajshahi. The undated article below appeared in a souvenir bill for a music conference in Calcutta. Pt Radhika Mohan writes about his guru, Ustad Ameer Khan. The use of the word ‘Shahib’ after the name of the Ustads is customary out of respect. When the requests came to me from the organizers of this function to write an authentic account of my revered Ustad, I had several reservations in my mind. In the first place, according to the high ideals of Indian tradition, a disciple is not supposed to utter anything but praises for his Guru or Master, because of the very simple reason that a Guru is always a Guru, alive or dead, and as such is beyond all critical study. And secondly, if one has to tell the truth, his remarks may stir-up unnecessary commotion amongst the supporters of other eminent musicians and adherents to different schools of musical traditions. Our society, especially the musical society, is yet ready to face the truth or accept any observation with a rational outlook. In most cases, we are guided by emotions and not by reasons. But in spite of all these considerations, sometimes one has to succumb to outside pressure, particularly if that pressure comes from near and dear ones. So I decided to write this story about my Ustad in a very simple and matter-of-fact way, because my Ustad Ameer Khan Shahib was really a very simple man with rare qualities of head and heart. Ustad Ameer Khan Shahib had a very detached view about life and worldly needs. He had only two attachments for his earthly existence, (1) Music, which was almost his very life & breath and (2) Opium, which he used to take more as an aid to his ‘SHADHANA’ for aesthetic and artistic realizations than as an ordinary intoxicating element to satisfy his mundane requirements. He was also suffering from acute asthma towards the end of his life and it might also have been one of the reasons for his addiction to opium in the hope that it would lessen his physical sufferings. About food or clothes, he was utterly indifferent and for minting money he did not have any particular desire. He was immensely satisfied with what he had and did not care for anything more. He did not make any distinction between his rich and poor students, treating them all alike, even if some could not afford to pay him any fees at all. Money to him was no attraction. He wanted to give what he had and was not really interested in getting anything in return. This, in short, is the image of my Ustad as I knew him. Now I will give an idea of his musical heritage and the distinguishing features of the Gharana or School to which he belonged. Ustad Ghulam Ali Khan, the celebrated Rabab player who is also supposed to be the first musician to have effected the modification of the Sarod from Rabab, was a court musician of the last independent King of Oudh, Wazid Ali Shah. Ustad Ghulam Ali Khan had three sons of whom Ustad Murad Ali Khan was the second. But Ustad Murad Ali Khan was childless, so he adopted a boy named Abdullah Khan, who belonged to the family of a hereditary vocal musician of Shahjahanpur. So by adoption Abdullah Khan was the legal son of Ustad Murad Ali Khan to all intents and purposes. And this Abdullah Khan was the father of my Ustad Ameer Khan and his brother Wazir Khan, who had settled in Lucknow and died sometime between 1940 and 47. I have given a genealogical table at the end of my article for the convenience of my readers (not reproduced, same as Shahajahanpur Gharana genealogy). I was told by Ustad the late Ameer Khan Shahib, when I was a boy of say 10 years, that Ustad Murad Ali Khan Shahib had some domestic difference with the other members of his family and he finally left them with a vow that he would put someone in the way to efficiency by instructions and practice and carve out of him a Sarod player of such great calibre who would, in time, would be a tough challenger to all other Sarod players of Hindustan. He kept his vow and Ustad Abdullah Khan Shahib, the father of my Ustad, was the Sarod player, whom he trained with all the devotion and care, which he had at his command. I am very happy to say that I did receive personal corroboration of this fact from no less a person than the late Khalifa Badal Khan Shahib. The rumour goes that whenever anybody wanted to listen to a recital or Alaap of any Raga from Ustad Murad Ali Khan, he would invariably direct him to go to Ustad Abdullah Khan because he himself considered Abdullah Khan to be a much better Alap player than himself. Then he would say, “If you want to listen to some recitals of Gat-Toda, come to me, and myself and my son Abdullah will play this gat together.” Ustad Murad Ali Khan even used to say with great pride that Ustad Abdullah Khan, his son, had surpassed him as a Sarod player. Both these Ustads, Murad Ali & Abdullah Khan were court musicians of the Darbhanga Raj. But my Ustad Ameer Khan Shahib had received his musical training more from his grandfather Murad Ali Khan Shahib than his father Abdullah Khan Shahib. The particularBaaj in which this great Gharana specialized is known as the Ferozekhani style. The Ferozekhani Gats are generally played in medium and medium-fast tempo rather than in fast tempo like Razakhani Gats. It is also marked by smart jumps from one octave to another with a surprise movement and is generally composed of at least three cycles of a Tala movement. Sometimes the Sthayee and the Antara portions do not have different identities, but are coalesced into one unified entity. Let us now have a look at the musical scene of the then united Bengal about the time when my Ustad first came to Calcutta at the age of a mere twenty years, sometime in 1906 or 1907. He perhaps visited our ancestral home at Rajshahi, now in Bangladesh, in the same year, as my Father says, that he was in his teens when Ustad Ameer Khan Shahib came to our house. At that time this great metropolis was literally teeming with great Maestros in almost every field of music. Amongst those who used to live permanently here in Calcutta, names might be mentioned of Ustad Keramatulla Khan (Sarod), Ustad Ashadulla Khan (Kaukuv Khan in Sarod & Banjo), Khalifa Badal Khan (Vocal Music & Sarengi), Pandit Lachhmi Prasad Misra (Veena, Vocal Music & Tabla), Khalifa Abid Hussain Khan & Ustad Masidulla Khan (Tabla), Pandit Shiv Shevak & Pashupati Misra (Vocal Music & Sitar), Ustad Ramzan Khan (Tappa), Ustad Imdad Khan (Surbahar & Sitar) and a host of other eminent musicians. Ustad Enayet Khan Shahib in Sitar & Surbahar and Ustad Chotey Khan Shahib in Sarangi joined them at a later stage. Ustad Alauddin and Ustad Hafiz Ali Khan Shahib used to live permanently in Maihar & Gwalior respectively, though both of them used to pay occasional visits to Bengal. It was not a very easy job to rise into prominence or attain immediate success or fame, particularly for an unknown artist of a comparatively immature age, when hoary-headed giants were already holding the forts in almost every aspect of Indian Classical Music. But Ustad Ameer Khan Shahib was made of completely different material and was not afraid to meet any giant in a duel. He had real music in him, which was not only different in style and form, but also had an unusually delicate and charming flavour, which was at once intellectually thought-provoking and aesthetically immensely satisfying, so much so that within a very short time he was universally acknowledged as a stalwart in his own field and by his own right. As I have already told before that Ustad Alauddin Khan Shahib & Ustad Hafiz Ali Khan Shahib did not make Calcutta their permanent home, but used to pay occasional visits from time to time. Therefore, the duty of imparting lessons in Sarod to musical aspirants in those days naturally fell on Ustad Keramatulla Khan Shahib (Sarod), Ustad Ashadulla Khan Shahib, and Ustad Ameer Khan Shahib. But unfortunately Ashadullah Khan Shahib, who is better known as Kaukuv Khan Shahib died a premature death in the year 1915. So the young learners of Sarod had to choose between Ustad Keramatulla Khan Shahib and Ustad Ameer Khan Shahib, and both of them shared their responsibilities with an open heart and almost with equal number of students. There is hardly any doubt about the fact that what Bengal has achieved today in the field of Sarod, is mainly due to those great Maestros, through their blessings, painstaking efforts and wonderful method of teaching. Before I finish this article, I feel that is one of my solemn duties to point out to the readers the change of attitude noticeable amongst the musicians of today towards music. The old masters believed passionately the excellences is musical performance lay in strict conformity to the traditional concept and orthodox forms of Raga-Sangeet. A Raga, to them, was a symbol of eternal beauty, realised and realisable. Music being the vehicle of a Raga, there was hardly any room for self-expression in the name of creative inspiration. By creation they really meant a sort of ritualistic invocation to their favourite Music. According to them, therefore, the presentation of music must be as systematic and thorough as possible and appropriate techniques should be applied to that extent only, which was essential for the creation of purest forms of music. Their approach to music was more of a Devotee rather than a Creator, and they sacrificed their individuality to the sacred altar of Raga-Sangeet. It is this self-surrender and not in super-imposition of their personalities, that they found their highest fulfillment in Art. The present-day attitude, however, is quite different. Modern artists believe more in technical innovations and new art forms than mere conformity to the age-old traditions of Raga-Sangeet. Deviation from tradition, according to them, is no sin if it adds luster to the existing forms. A Raga is not a living organism, but just an artistic symbol without any form. It is the artist who gives form and infuses life to a Raga and in so doing the artist must be allowed his unquestionable prerogative of individualism. Art in itself has no meaning, if it does not help the artist the realization of his own personality through creation. Hedonism and not Self-negation, is the basic principle of modern Musical Art. Thus, while old masters concerned themselves with the realization of pure beauty in Art, the modern artists are primarily satisfied with creating beauty through Art. To the old masters, technique was just a means to an end, the end being the realization of eternal beauty in Art, which transcends all techniques. Technique, to the modern artist is not only a means but also an end in itself, the end being the creation of beauty, which is imminent with and not independent of technique. Here ends he story of my Ustad. My respectful Pranams (respectful regards offered by a disciple to a Guru) to him with all the humility I have at my command.